As an artist and energy healer I am fascinated by the interplay of Masculine and Feminine energies not only between man and woman, but also showing these opposing forces both in the individual and at large in society and in the Universe. 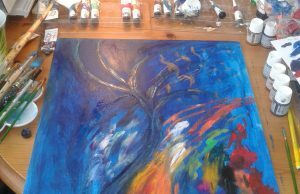 Depending on the subject I am working on, my style is a mixture of expressionism, figurative art, symbolism and abstract art. My art is all about bright colours, movement and fluidity. I use art in different ways, for different purposes. I run workshops to help the participants to connect with their intuition, build their confidence and find their dormant abilities and skills to break through limiting beliefs, feel good about themselves and feel ENOUGH. My abstract artworks are featured on everyday items, like phone cases, bags, yoga mats… even furniture. They are available to buy from my Society6 Shop. I unite the energies of colours, with Law of Attraction principles and expresses the result through art. Her channelled paintings come with additional messages, which your subconscious can receive, simply looking at her art. In some occasions, she shares these messages with you in a form that your conscious mind can understand too. 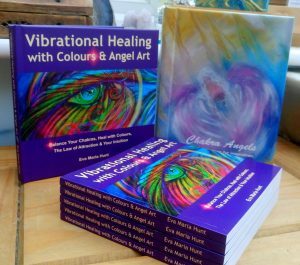 In her book, Vibrational healing with Colours and Angel Art, she does exactly that. Her paintings are full of light and healing energy frequencies. My book “Vibrational Healing with Colours and Angel Art” is a fun and easy to use energy tool, focusing on helping you to connect with your soul, developing your intuition through the energy of colours and her channelled paintings, whilst feeding your logical mind too through simple explanations and some of the Law of Attraction’s proven recipes. 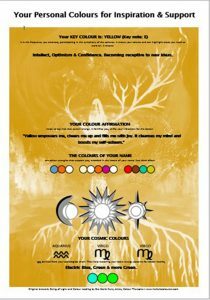 Colours have been used for thousands of years for their psychological & healing properties. set your Mood, Space & Mind for Health, Joy and Success. Cleanse & energise your mind, body & soul with Colour Energy! Colours are the purest healing force of the Universe, vibrating on different frequencies. They can lift your mood, reduce symptoms of mental, emotional and physical illnesses, vitalise your organs and help cleansing your energies. You soak them up in 3 different ways: through your eyes, skin and chakras (energy centres). 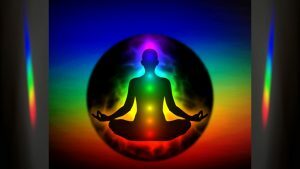 We generally talk about 7 chakras in energy healing, yoga, etc. However as the frequency of the Earth changes and we personally are able to raise our vibrations, our dormant chakras become active, open, forming a 12 chakra system. 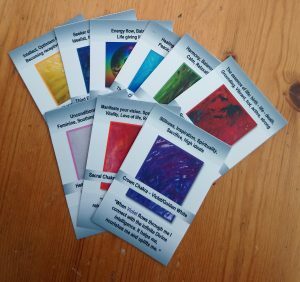 I created these cards specifically for working with your 7 chakras initially. However in my paintings I incorporated colours corresponding with your energy centres on different frequencies. So if you already have reached a higher frequency or aiming to do so, you can work with other colours too, accordingly. As you see, colours are amazing! Use them the right way and you have a support system around you that constantly radiates good vibes and inspires you, whatever you do during the day. So stay in the know, find out about my colour adventures, new products and little projects you can use to improve the energies in and around you.